How do those people with those constantly organized homes do it? Are they constantly cleaning? Do they even work? Where do they find the time? 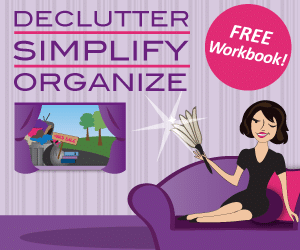 The truth is, keeping your home organized requires that you change your thinking. By changing your thinking and building new habits, you can organize in a way that is natural to you. You know how you can stay really organized? By not having as many things. If something isn’t bringing you joy, you probably don’t need it. If you have boxes you haven’t opened from your last move, throw them out — and if you have appliances that you haven’t used in years, consider giving them away. Rather than giving yourself an overflowing to-do list, instead set aside a specific amount of time every day for cleaning. It doesn’t matter what you choose to do during that time — maybe you’d prefer to do laundry or clean the bathrooms — it just matters that you do it. Cleaning for some amount of time every day can be easier to manage than having to accomplish specific tasks. Too often, it’s easy to assume that you have to do everything on your own. Don’t be afraid to delegate tasks — it’s time for those kids to start earning their keep! When you delegate, expect that the tasks are going to be done wrong at least a few times. This is an investment in your future: eventually the tasks will be done the right way, as long as you take the time to teach. Get into the habit of purchasing organizers and storage bins when you notice you need them. You may be surprised to find out how much the right organizer matters. Not only will you know exactly where everything goes, but you’ll also be able to keep your items in a compact, consolidated format. A small investment in organization will reduce frustration for you long-term. If there’s an organizational task that you’re putting off, use the “1..2…3” method. Count to 3 and, at the count of 3, just do whatever you need to do. This is a little psychological trick that people can use to get smaller tasks done. Another general rule is: if something takes only five minutes to do, do it now. By taking care of these tasks early on, you can avoid building up a long list of things that have to be done. Cleaning will eventually become an automatic process that you do whenever you’re around something that has to be cleaned. A common method of doing this is to get into the habit of cleaning while you cook. As you cook, you can be washing dishes that you’re done with, throwing things like wrappers out, and wiping down counters. Mark off a specific day on your calendar for household cleaning tasks. If you already know that Sunday is Laundry Day, you’ll find it easier to plan around and it’ll be less likely that you forget to do it. Keeping a schedule prevents you from letting your cleanliness and organization slip; it’s always harder to clean a messy home than it is to maintain a well-organized one. It’s easy to get into the habit of tossing your coat on the couch, your keys on the table, and your shoes, well, anywhere. Unfortunately, when things don’t go into their proper place, they tend to remain where they are. Get into the habit now of always putting things down where they belong, rather than setting things down on a flat surface and hoping for the best. Can’t keep it all organized? Don’t stress. Everyone has difficulties keeping themselves organized from time to time. Building your habits and changing your thinking is a process and it’s not going to happen overnight. By following the above tips, you should be able to slowly change the way you approach organizing and cleaning your home — eventually it’ll become second nature. Great article! I am excited to make 2019 my most organized yet! Happy New Year!